Hyperdrive Massacre is exactly what it says on the tin; a super fast game that gives the player the ability to continually destroy their friends in a variety of game modes over and over again. Its simple controls coupled with its fast paced action creates an experience that can be enjoyed by you and up to three other friends. Although it isn’t without its faults, Hyperdrive managed to keep me, and a number of my friends, coming back to test out each others massacring ability time and time again. The main draw of Hyperdrive Massacre is its fast gameplay. It reminds me very much of Knight Squad due to its easy to learn, but hard to master gameplay. To put it simply, all you need to worry about when playing the game is the throttle, brake, the direction you are facing and exactly when to shoot. This creates an experience that is both very accessible and easy to understand to anyone who wants to give it a go. However, there is a skill to mastering the controls. 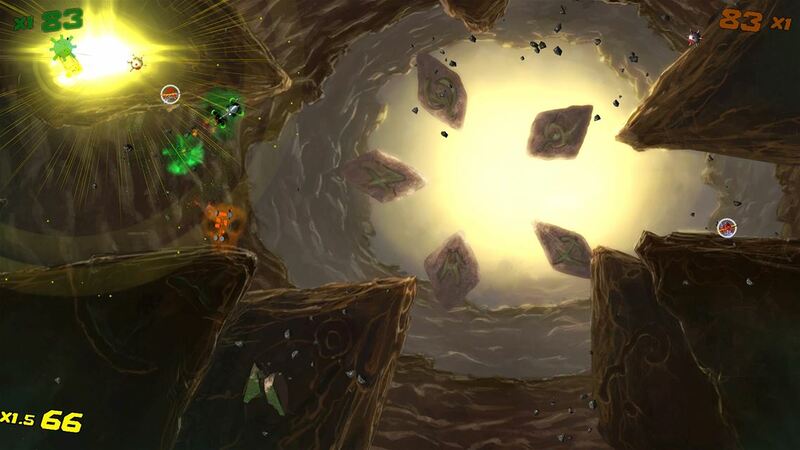 The game allows you to slowly find better ways to hone your techniques, allowing you to gain an advantage over your friends. One thing I would say is that at times the movement felt sluggish and didn’t quite keep up with the fast paced, space aged soundtrack. However, apart from this the overall feel of the game was fairly positive. I found that the simplified control scheme also works to compliment the easy to understand gameplay of Hyperdrive. There are six different game modes for you and your friends to try out; each of these provide the players with a slightly different experience while still maintaining that all important competitive spirit. In the main game mode, Deathmatch, four people are pitted against each other, all with the same goal; to destroy as many of their friend’s space age Cadillacs as they can. It doesn’t have to be all about combat either. Whilst modes like Deathmatch, Team Deathmatch and Last Man Standing require you to decimate your opponents to win, Death Race, Space Soccer and Spong offer alternative objectives. Death Race has competitors racing to claim checkpoints on the screen, taking out all who stand in their way whilst avoiding other players’ attacks if necessary. 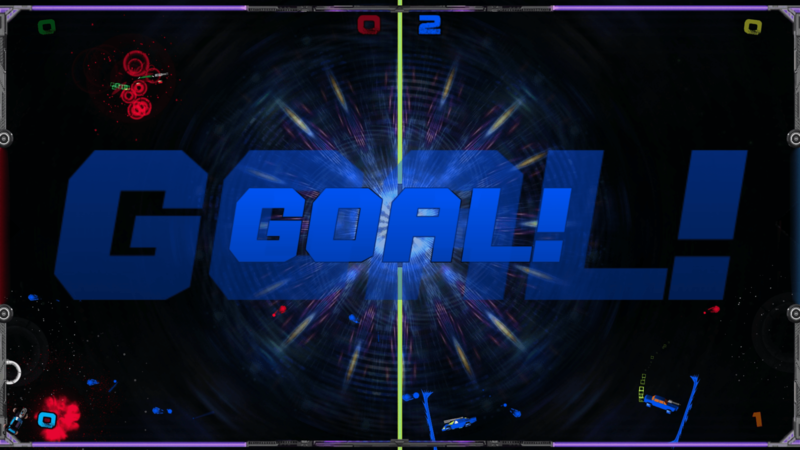 Space Soccer is just what it sounds like, with players forming into two teams before battling to score a set number of goals. And finally, Spong plays like air hockey, with two teams of players confined to their own side of the screen, yet still trying to get the ball in the goal like in Space Soccer. 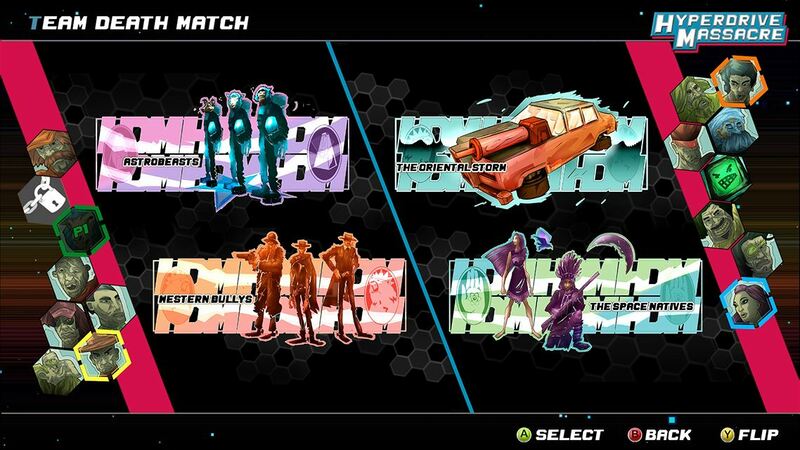 Whichever mode you choose, they’re all highly enjoyable, and offer a great deal of variety to Hyperdrive Massacre’s gameplay. Within each game mode there is a set of eight power ups that you can collect to give yourself an edge over your opponents. These range from a long ranged laser beam to a more scattershot shotgun type upgrade. Although it was nice to have them included in the game, I never really felt more powerful using one as, just like the regular laser blast, they are all one shot, one kill. In the game you also have access to many different characters, 16 in total, with some of them being locked out from the beginning. Unlocking the plethora of characters is a fun mechanic due to the variation of characters you can gather. From normal men and women to face sucking monsters and a bright blue sheep, each with their own hyper stylised car to match, the cast manages to remain fresh through out. Each of the levels are different with some nice backdrops and music with definite inspiration from popular 1980’s movies included. In fact, the music is one of my favourite aspects of the game as I felt it enhances the overall gameplay experience. It is great to bomb around the map while listening to a very bass heavy, techno soundtrack. Graphically the game is pretty simple. 3D cars and Asteroids over a 2D background isn’t anything amazing but I don’t believe that the simplicity detracts anything from the gameplay. Characterised by an 80’s look, Hyperdrive Massacre is a hectic and bizarre space car battle party game; with friends and multiple controllers it becomes very absorbing and thrilling. While the the lack of online multiplayer and slightly lacklustre power ups do hold it back, I believe that overall Hyperdrive Massacre is a great local player game that anyone can enjoy. I am an 18 year old eager to break into the world of games journalism. I am hoping to go on to do a degree in classical civilisation before going on to pursue further avenues in the world of games. I have been an avid gamer since the reviewing my first console, the PS1 but have remained faithful to the xbox community since receiving an xbox 360 in 2007 and haven't stopped playing since. I'll play any new or old game that is put in front of me and I look forward to sharing my thoughts and opinions with the The Xbox Hub's community!